Tax season is upon us. There. Did you break out in sweats? You could have avoided some major receipt wrangling had you methodically scanned them, instead of collecting them and putting them in that jar of yours. But scanning receipts on the go is tedious at best. 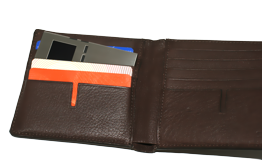 Unless of course your scanner is so darn small it fits in your wallet. Like this SlimScan device from PlanOn. It measures a measly 2.0 x 3.1 x 0.12 inch (51x79x3mm) and is able to scan receipts that are up to 2.75 inch (70mm) wide and up to 36 inches (90 cm) long in 300 dpi resolution. Like for those office dinners or something. You place it edgewise on the receipt and drag it across. Up to 600 images are stored in its memory before they need to be transferred to a PC via USB. At that point you have a ton of options, including character recognition, editing, categorizing and even creating reports. For $140, you can save yourself a few headaches and a decent chunk of change in unclaimed expenses.